She was stung by a bee. 彼女はハチに刺された. 〔+目的語+前置詞+名〕〈人の〉〔体の一部を〕刺す 〔on，in〕《★【用法】 体の部分を表わす名詞の前に the を用いる》. A bee stung her on the cheek. ハチが彼女のほおを刺した. The smoke began to sting his eyes. その煙で彼の目はひりひりし始めた. I was stung by the insult. 侮辱されて感情を害した. My conscience stung me. 私は良心がとがめた. These words stung me to [into] action. これらの言葉に刺激されて私は行動を起こした. Her ridicule stung him into making an angry reply. 彼女にひやかされて彼はかっとなって返事をした. He got stung on the deal. 彼は取引でだまされた. He got stung for $100. 彼は 100 ドル巻き上げられた. Not all bees sting. ハチがみな刺すとは限らない. The slap made his hand sting. 平手打ちをしたら彼は手が痛かった. take the sting out of… …から痛みを取り去る, 苦痛をやわらげる. the sting of a person's tongue 毒舌. A bee stung me on the arm. A grain of sand stung my eyes. My conscience stung me sharply. Her words stung him into losing his temper. My toes were stinging after standing for three hours in the snow. I was stung on the arm by a wasp. From Middle English stynge, sting, stenge, from 古期英語 sting, stinċġ (“a sting, stab, thrust made with a pointed instrument; the wound made by a stab または sting”), from Proto-Germanic *stangiz. A sample recording of the performance of a sting. A bump left on the skin after having been stung. A bite by an insect. 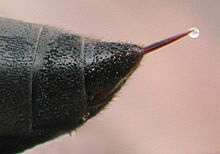 A pointed portion of an insect or arachnid used for attack. (botany) A sharp-pointed hollow hair seated on a gland which secretes an acrid fluid, as in nettles. The thrust of a sting into the flesh; the act of stinging; a wound inflicted by stinging. (law enforcement) A police operation in which the police pretend to be criminals in order to catch a criminal. A short percussive phrase played by a drummer to accent the punchline in a comedy show. A brief sequence of music used in films, TV, and video games as a form of punctuation in a dramatic or comedic scene. A support for a wind tunnel model which extends parallel to the air flow. The balance is mounted externally on top of the wind tunnel test section. A sting connects the balance to the model. (figuratively) The harmful or painful part of something. The point of an epigram or other sarcastic saying. From Middle English stingen, from 古期英語 stingan, from Proto-Germanic *stinganą. Compare Swedish and Icelandic stinga. (transitive) To hurt, usually by introducing poison or a sharp point, or both. Still, it stung when a slightly older acquaintance asked me why I couldn't do any better. (transitive, of an insect) To bite. (intransitive, sometimes figurative) To hurt, to be in pain. My hand stings after knocking on the door so long. But Birmingham were clearly stung by some harsh words from manager Alex McLeish at the break and within 15 minutes of the restart the game had an entirely different complexion. (figuratively) To cause harm or pain to. I thought I could park in front of the hotel, but they stung me for five pounds! From Proto-Germanic *stangiz; akin to stingan.